I write this the afternoon of my last day of work before my sabbatical, Sunday March 31. What a wonderful send off this morning! I’ll treasure gifts from the Religious Education Council – the gift card to Kripalu; the beautiful journal and very cool pen; memories of very chocolate cake – and also the kind, sweet and heartfelt messages in the journal from you, the congregation, to wish me well and to bless my sabbatical. Thank you. I appreciate all of you. I am so looking forward to these next two months. As I’ve been wrapping preparations up at Albany UU, I was also thinking of what I had to do at home. “Clean out the fridge,” a voice in my head said. “And start packing!” as if I’m heading out on vacation. But then I would think again, because I’ll be at home about half the time, and my first trip isn’t until the first weekend in April. Like many of us, I am so used to go, go, go! And that’s not always a bad thing; I love my work. But the next two months will include different kinds of work, with different kinds of “go-go-going”. 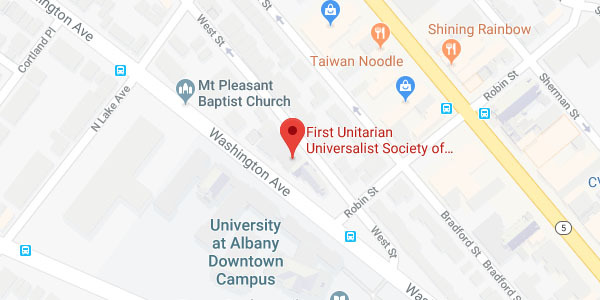 As I’ve been sharing with folks, I’ll be visiting four UU congregations to see how they do things and what innovations they have made: Jefferson Unitarian Church, in in Golden, CO; Emerson Unitarian Universalist Congregation in Marietta, GA; and the two UU congregations in Rochester NY: Rochester Unitarian (with 742 adult members and 205 children in RE) and First Universalist Church of Rochester (163 adult members and 20 children in RE). I expect that each congregation will have a lesson or two for me; I’ll strive to be open to it all. And I’ll be attending three or four weekend retreats/programs at Kripalu, the Buddhist Retreat Center in Stockbridge, MA. My first weekend program is “The Natural Singer: Find Your True Voice.” I’ll also have time at home or day trips to do some things I’ve been longing to do. I want to experience beauty more, create with my hands, take time to be with old friends, read; and treat my body with care. On sabbatical, all of these things are soul work and spiritual work. Or instead of “work”, perhaps “explore” and “experience” are more apt words. I’ll share a bit of my experiences on Face Book the next two months; and in the May Windows. At the service on June 2nd I’ll be able to give you a fuller story, so, I hope you’ll come; it also RE Sundae Sunday! I’ll write up my learnings for the Religious Education Council, the Board and Rev Sam. It really is something special for a congregation to send their religious educator on sabbatical. It shows how much you value the Religious Education program and ways the religious educator works in other aspects of the congregation. And it shows the importance you place on supporting the religious educator and offer care to that person. To prepare for my sabbatical I created a spread sheet of all my DREFM tasks; and then the Religious Education Council, Rev Sam and I considered which ones were essential and which ones would be would “let go”. Many thanks go to Elizabeth Baldes, our RE Program assistant; Jim Hutchins, our RE Council Chair, members of the REC; and Rev Sam for pitching in to cover for me. The RE volunteers and the families will continue to be supported. But you will notice some differences while I’m away: parents/caretakers and the RE volunteers won’t receive my weekly emails; no Sunday Sparkler (the printed RE weekly newsletter); you’ll see other people besides me presenting the Wisdom Tale in the service; and I won’t be part the multigenerational services. The REC will run their meetings and business without me and I won’t be active other committees in the congregation I’m part of or following. My sabbatical will give you opportunities for different experiences. You might gain new perspectives; and clarification about what’s valuable to you. So, I hope you’ll note what you’re experiencing while I’m away from Albany UU. When I’m back in June, I’ll look forward to hearing from you on what it was like for you. You may know the Zen teaching, “Before enlightenment, chop wood, carry water. After enlightenment, chop wood, carry water.” The idea, as I understand it, is that the work one does for enlightenment, (or your life’s goal or perhaps your work goal), does not go away afterwards. The way you do your work is part of the fulfillment. When we are able to be in the moment, we no longer feel compelled to watch the clock. Whatever your work might be, bring all of yourself to it. When you are fully present, you may find that your labor is no longer a burden. Wood is chopped. Water is carried. Life happens. Easy for me to say; my work burdens have been removed for two months! And many of you are taking some them on! But I hope that when I return, all of us can find at least a little more peace in the moment; fulfillment in our work together; and just maybe, a more enlightened way of chopping the wood and carrying the water. Our life as a community will happen.